In Vacation Under the Volcano, Book 13 in the Magic Tree House series, Morgan Le Fay sends Jack and Annie to Pompeii. Their assignment: rescue a special book, Vir Fortissimus in Mundo (The Strongest Man in the World). As they spin back in time to the Roman Empire, the two Master Librarians are unaware that within minutes of their arrival one of the worst natural disasters in history will happen. Around one o'clock in the afternoon, on August 24, AD 79., Mount Vesuvius in Italy erupted, burying the city of Pompeii in pumice and ash. 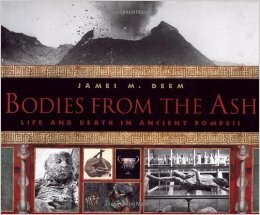 To learn more about Pompeii and the volcano, I turned to Bodies from the Ash, an exciting narrative about the eruption, the excavation centuries later of Pompeii, and the story of the plaster bodies. Just what were plaster bodies? The technique of pouring plaster into hollow cavities left behind by the decaying bodies. First used in 1863 by excavator Giuseppe Fiorelli, the cavities were caused when volcanic matter surrounded a body and hardened as it cooled. A body would decay inside the hardened deposit, leaving behind a hollowed space and a skeleton where a body once lain. Over time, these mummy-like plastic people have offered visitors a glimpse of life during the Roman Empire. The text is complemented by numerous black & white photos that are well captioned. Back matter includes bibliography and index.